LEXINGTON, Ky. (Aug. 17, 2018) — By all accounts, David Ryan Gordley was a generous young man. After joining the Air Force, much of his time was spent on mission trips, helping the less fortunate in third-world countries. On New Year’s Eve 2016, David was returning home to Georgetown when a car in the opposite lane crossed over the center line and hit his car. He died from his injuries a few days later on Jan. 4 – his 35th birthday – at the University of Kentucky Chandler Hospital. Unbeknownst to his parents, David had registered as an organ donor while in the military. Both kidneys, his liver and his heart went to patients desperately in need of a transplant, and other bodily tissues were donated to a tissue bank. 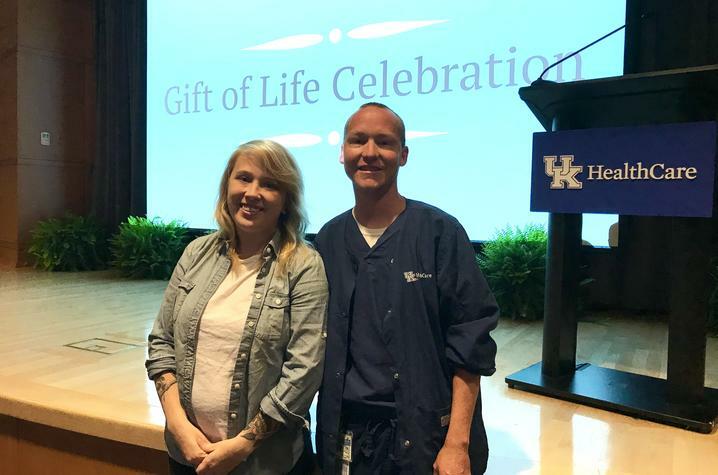 Last Saturday, UK HealthCare and Kentucky Organ Donor Affiliates (KODA) honored David and other selfless donors like him at their annual Gift of Life Celebration. 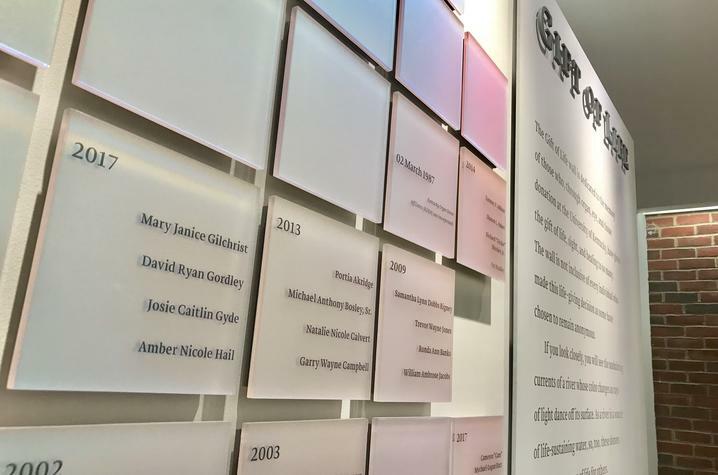 This year, nearly 300 donor family members and friends attended the celebration, while the names of 83 individuals were read aloud during the official ceremony and unveiled on the Gift of Life wall, located inside Pavilion A adjacent to the Gill Heart Institute. Each year, the wall is updated to honor both new donors and those who have donated in years past. This year’s group was the largest honored since the wall was first unveiled in 2012. To date, more than 480 donors have been memorialized. Two transplant recipients offered remarks on how transplantation has changed their life. UK HealthCare anesthesiologist Dr. Kevin Bauereis has spent his life battling cystic fibrosis; he received a double-lung transplant five years ago and now helps patients across all of UK HealthCare, including other transplant patients. Adrianne Rogers was just a teenager when her heart began to give out. Diagnosed with a heart murmur and later, restrictive cardiomyopathy, she grew sicker and weaker until it became clear to her UK physicians that a transplant was her only option left. At 23, she got a new heart. For patients struggling with organ failure, a transplant may be their only option for survival. Every day, approximately 20 people die while waiting for an organ transplant. More than 114,000 Americans are currently waiting for donated organs, including nearly 1,000 people in Kentucky. Their names are on the United Network for Organ Sharing (UNOS) waiting list. The level of necessity, blood type, and size are among several criteria that determine who can receive a donated organ. One individual donor can provide organs and tissue for nearly 50 people in need. 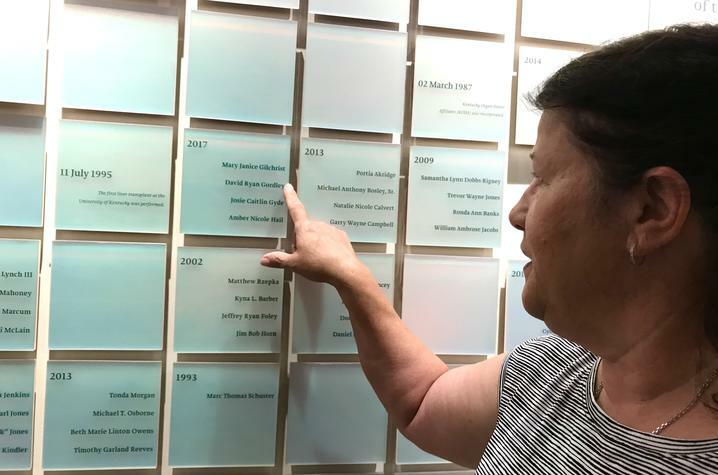 Linda initially heard about the organ donor wall while at the hospital with her son, and she later received an invitation later to have his name added to the wall. She notes that he didn’t care much for attention, but she felt his altruistic choice needed to be honored. To join the registry, visit www.donatelifeky.org or sign up when you renew your driver’s license. The donor registry enables family members to know that you chose to save and enhance lives through donation. Kentucky’s “First Person Consent” laws mean that the wishes of an individual on the registry will be carried out as requested.